We’d love your help. Let us know what’s wrong with this preview of What Goes Up by Wen Baragrey. Robyn Tinkerbell Goodfellow (yes, that's actually her name) has a target on her roof. Well, not a real one, but everything seems to land there: paper airplanes, lost kites, socks, cats, and once even a skydiver! In the town of C What goes up . . . comes down on Robyn Tinkerbell Goodfellow's roof! Will a rogue NASA satellite crush her house before Robyn can set things right? To ask other readers questions about What Goes Up, please sign up. Loved this book! I am so blessed to know this author personally, and during a stay with her this year in New Zealand I was lucky enough to read the as yet unpublished version of this book. It is BRILLIANT! Funny, heart warming. Giggle-out-loud kind of good stuff. And I am so excited to buy a copy when it hits the shelves in 2017. I can't wait until its release date! So it's the 15th of November 2018 and my dear friend, Wen Baragrey, is finally holding her book in her hands. Today I finish Loved this book! I am so blessed to know this author personally, and during a stay with her this year in New Zealand I was lucky enough to read the as yet unpublished version of this book. It is BRILLIANT! Funny, heart warming. Giggle-out-loud kind of good stuff. And I am so excited to buy a copy when it hits the shelves in 2017. I can't wait until its release date! So it's the 15th of November 2018 and my dear friend, Wen Baragrey, is finally holding her book in her hands. Today I finished re-reading the book, this time the real life, hard cover version, which was a special treat indeed. It's not often you get to stand next to a book where you have had to privilege of watching the author grow, of writing along side them and of celebrating moments big and small. It's not often you get to be THIS proud. And I am. I am truly proud of both Wen and her book. 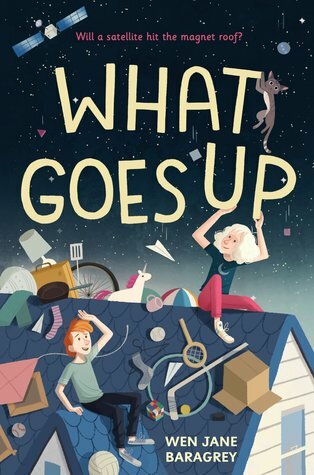 WHAT GOES UP is a funny, quirky little book, but it's so much more. Behind the over-active imagination of 11 yr old Robyn Goodfellow is the heart of a girl grieving the father she doesn't know. Her adventures to find this man lead to her discovering beautiful things about found-families as well as those imperfect, but wonderful people who are related to us. I love Robyn, her fairy mother the host of characters romping through her world. A wonderful read. Now to re-read this book to my children. First time was mine to savour alone. Now I get to enjoy it all over again with them. Robyn lived in a house, which she claimed had a "magnetic roof". For some reason, projectiles had a tendency to take up residence on her rooftop. Therefore, when she learned of the NASA satellite's return to Earth, she was worried it would also be attracted to her roof and most likely destroy her home. This news, along with seeing a local family filled with people who looked like her, who also had albinism, spurred Robyn to search for the father she never knew. Robyn was such a fabulous character. It was instalove for me. I loved her voice, and the way she navigated her emotions, as well as the feelings of others. There were a few times, where she put her own interests before other people's, but she would back up, recognize it, and correct herself. I liked seeing that in an almost-12-year-old. Robyn was also determined and tenacious, and I loved her go-get-em attitude. Her need to know more about her father was never more clear, than when Robyn compared how she looked like she doesn't belong in her family, and how "other" she always felt. I know I wanted her to get some answers, because I grew to adore and care for her very much. Robyn was really lucky to have an awesome best friend (future-husband) named Nickel. Yes, his whole family was named after coins, but that didn't hamper him from supporting Robyn when she needed him most. There were actually a few really, really heartwarming moments shared between the two. One was this heart-to-heart he had with Robyn in the later part of the book, that made me shed some really happy tears, because it was such a precious exchange, and clearly illustrated how much her friendship meant to him. Not only did Baragrey gift Robyn with Nickel in her life, she packed the town with some fun and eccentric characters. Robyn's mom was obsessed with faeries, and even managed to make a career of it, while her grandmother carried on a friendly-ish feud with the nosy and delusional neighbor. Many other interesting denizens rounded out the cast, and it was a pleasure getting to meet them all. Overall: A touching and heartwarming story about family, friendship, and belonging, which will make you laugh, cheer, and smile. Like the author, when I heard about the satellite that was threatening to fall on Robyn's house, I thought of Skylab that was supposed to fall somewhere in Australia in the late 1970s. It is an interesting fear, but when you hear that something like that can fall out of the sky, and in Robyn's case, everything that falls out of the sky lands on her house, it is a valid fear. But, that is not the only thing that is going on in this story.. Robyn is also thinking, in her fear of being struck by spa Like the author, when I heard about the satellite that was threatening to fall on Robyn's house, I thought of Skylab that was supposed to fall somewhere in Australia in the late 1970s. It is an interesting fear, but when you hear that something like that can fall out of the sky, and in Robyn's case, everything that falls out of the sky lands on her house, it is a valid fear. But, that is not the only thing that is going on in this story.. Robyn is also thinking, in her fear of being struck by space junk, that she would like to meet her father before she is a goner, so she starts searching for him. Interesting story. Very real characters. A bit scattered, but real. Mother is eccentric, to say the least, but that adds to the oddness of the house. It did feel as though there was a lot going on for a middle-school book, that there could have been more about how Robyn had wondered about who her father was before she worried about her eminent demise. I'm always looking for funny books my kids will love that aren't part of a series of 12 nearly identical books focusing on potty humor. THIS IS IT. Charming, sincere, and oh so quirky. I loved Robyn and found her struggle to find her father coupled with her seemingly irrational fear of being hit by a rogue satellite oddly relatable for every kid. I loved the cast of eccentric characters--especially Robyn's best friend Nickel (whose siblings are Dime and Penny), Robyn's fairy obsessed mother who I'm always looking for funny books my kids will love that aren't part of a series of 12 nearly identical books focusing on potty humor. THIS IS IT. Frisbee, boomerang, rocket, bedsheets, it's probably on top of the Goodfellow's house. So when a rogue satellite plans to crash back down to earth, it's only natural Robyn believes its heading straight for their house. But there is more to this story, than meets the eye. With a father she has never known and a satellite threatening to flatten her house, time is running out. I would recommend this story to most ages 11 & older. I met Wen Baragrey online about ten years ago, sharing writing and dreams and life struggles. What has always stood out for me is her wonderful sense of humor, love of family, and talent for storytelling. Her debut novel, WHAT GOES UP, incorporates all that. Robyn Tinkerbell Goodfellow has a number of difficulties in her young life, starting with her name and her mother’s vocation of hosting fairy parties in their home. But Robyn’s biggest concern at the moment is a space satellite is falling to e I met Wen Baragrey online about ten years ago, sharing writing and dreams and life struggles. What has always stood out for me is her wonderful sense of humor, love of family, and talent for storytelling. Her debut novel, WHAT GOES UP, incorporates all that. But Robyn’s biggest concern at the moment is a space satellite is falling to earth. Her house has always been a magnet for falling objects like kites, balls, trees, and even a skydiver. She’s sure the satellite will be drawn to them and she will never meet her mysterious father. The story is filled with marvelous characters and has an ending that brought tears to my eyes. Published by Random House Children’s Books it is available now. I highly recommend it as a holiday gift for middle grade readers in your life (and even for yourself). I loved this book. It was awesome. It's one of my new favorite books. It was super funny. I loved the characters. 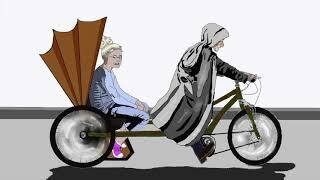 I especially loved the feud between Robyn's grandma and their neighbor. I liked that she was worried that she would die because her name would be in the paper and everyone would laugh at it. Overall I thought this was a great book. I suggest it to anyone because this book is pretty much good for anyone who likes funny things. This book is amazing! I fell in love with Robyn within the first few chapters. This book is so funny! It is the perfect book for everyone regardless if you like reading or not. Robyn's magnet roof and quirky personality were the best. I love this book so much! This quirky MG novel, which releases October 30, will make you laugh out loud as it tugs at your heartstrings. I loved Robyn’s mom, who dresses in tutus and fairy wings and makes a living having toddler fairy parties, her grandma who loves Robyn with all of her heart, but has a running feud with their crazy next door neighbor who insists she’s FBI, and especially her best friend Nickel, who is there for Robyn, no matter what. We learn Robyn is an albino, but this is not discussed in depth in the This quirky MG novel, which releases October 30, will make you laugh out loud as it tugs at your heartstrings. I loved Robyn’s mom, who dresses in tutus and fairy wings and makes a living having toddler fairy parties, her grandma who loves Robyn with all of her heart, but has a running feud with their crazy next door neighbor who insists she’s FBI, and especially her best friend Nickel, who is there for Robyn, no matter what. We learn Robyn is an albino, but this is not discussed in depth in the story. This wasn’t a problem for me, because I just enjoyed the quirkiness and warmth of the book, rather than expecting a window into the world of an albino child. For those looking for funny story about friendship, family and finding where you belong, this is a great choice. I would recommend it be added to elementary and middle school collections for grades 4-7. Odd little tale. I always like quirky ones best and this one wasn't disappointing. This book does have odd characters,Robyn is albino (though this has nothing to do with the story), and the story revolves around her and her family, friends and neighbors, and a satellite that is going to fall on her home! She's also searching for her father. Her mother has never has never told her about him (and for some odd reason she's never asked?). Anyway, her house attracts junk like a magnet, so it's a give Odd little tale. I always like quirky ones best and this one wasn't disappointing. 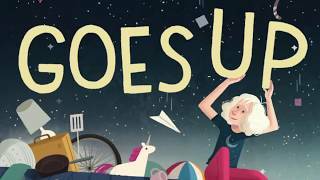 This book does have odd characters,Robyn is albino (though this has nothing to do with the story), and the story revolves around her and her family, friends and neighbors, and a satellite that is going to fall on her home! She's also searching for her father. Her mother has never has never told her about him (and for some odd reason she's never asked?). Anyway, her house attracts junk like a magnet, so it's a given that the space junk is going to hit it. Funny story overall about a loving family and their friends. Kids 4th grade up will likely enjoy it and they should! It's a great and busy read! Thank you to Random House Kids for a review copy of this book. All opinions are my own. While the theme is common, this cute and quirky tale has some original elements that move the classic “kid thinks she knows better than all of the adults around her” story to one that is entertaining and fresh. Everything falls on her roof as if it is magnetic. Nickel’s siblings are Dime and Penny. Mr. Bones rides a rickshaw for $1 a trip. With all of the silliness mixed with serious, I think this would make a Thank you to Random House Kids for a review copy of this book. All opinions are my own. While the theme is common, this cute and quirky tale has some original elements that move the classic “kid thinks she knows better than all of the adults around her” story to one that is entertaining and fresh. Everything falls on her roof as if it is magnetic. Nickel’s siblings are Dime and Penny. Mr. Bones rides a rickshaw for $1 a trip. With all of the silliness mixed with serious, I think this would make a fun movie. Readers of Elly Swart’s Smart Cookie and Susan Crowley’s FInding Esme will like this book. #kidlitexchange #partner This quirky book maybe wasn’t for me? I would have liked a little more exploration of what it was like for the main character to have albinism. I also found it confusing why her mother kept her in the dark about her father. No big flaws (except the balloon release at the end—why? ), but I also didn’t love it. I loved this book!! Robyn’s quirkiness and giant heart had me both laughing and crying. Loaded with wit, fairies and satellites it makes for a great read. I thought the author finished it just beautifully. Highly recommended! In a word - funny. I laughed out loud several times during this book. Kids who like humor will get a kick out of this. This was definitely original! It was funny but also serious and I thought it was nice that they added in diversity so that's a plus. Everything seems to land on Robyn's roof -- frisbees, trees, skydivers. So OF COURSE! the space trash heading to Earth is going to hit her house. NASA doesn't know everything. Charming, heartwarming, and funny. Everything I love in a Middle Grade book. To keep her mind off it, she writes books for middle graders, an age group she's never fully outgrown. It still comes as a complete surpris Wen Baragrey is a New Zealand earthquake survivor who recently turned tail and ran to the other end of the country to live on a farm, only to find herself surrounded by volcanos, cantankerous livestock, and giant slugs. Don't even get her started on the goats.